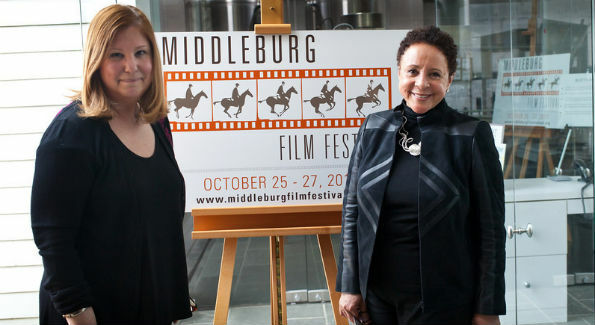 The Middleburg Film Festival opened this weekend, and you really have to come out to see it. Just hang a right on Pendleton at the Safeway and follow the blacktop road. The Salamander Resort will appear in the landscape and pull you right into the magic. Founded by Shelia Johnson (Producer of “The Butler, BET Founder), this festival is like nothing Virginia has ever seen. Filmmakers from all over the world are showing up with their films in this tiny Virginia town. In speaking with Shelia, she explained that she got the idea when her friend Robert Redford visited. A longtime Middleburg resident, Shelia helped to build a performing arts center at the Hill School. She sees this festival as just another way to support the arts and the local community. Documentary Filmmaker Susan Koch (“Kicking It”) collaborated with Johnson on several projects and was excited to come on board as executive director of the festival. Koch says she is committed to “foster an intimate and accessible festival experience.” To that end, the festival provided several workshops with industry professionals for up close and personal discussions about the process of making movies. I was able to sit in with award-winning film composer George Clinton (“Austin Powers,” “Bury Me at Wounded Knee”) as he gave a 90-minute class on his approach to scoring a film. I also heard from top film critics John Horn (Los Angeles Times), Ann Hornaday (The Washington Post) and Janet Maslin (The New York Times) what makes a good film, how to choose what films to review and how they approach the ever-changing role of the film critic. There is an amazing slate of films being shown. Academy Nominated lead actor Bruce Dern presented the film “Nebraska” and was on hand for the Q & A after the screening. And though I was not able to get in on it, Lee Daniels (Director of “The Butler”) attended a screening of “The Butler” and hosted a discussion about the challenges of making the film when the studios were not interested. The only thing missing for me was a handful of films from Virginia filmmakers. Ms. Johnson promised they would make room for some of these in the future and welcomed the opportunity to review some locally produced projects. I have to admit that I submitted my recently completed feature film “Bright Lights and Promises,” but it did not make the cut. This festival is in good hands, as Johnson is one of the most successful businesswomen ever, and told me “this will not be a one-off. We will be back next year.” I will be back as well, looking for the best films from all over the world and maybe a few from the neighborhood. “Romeo and Juliet” may be the world’s oldest story ever told. Not because Shakespeare (William Shakespeare from “Shakespeare In Love” – at least that’s how I think of him) wrote it more than four centuries ago, but because when Eve met Adam it was love at first sight, and then a problem arose. While this story has been done hundreds of times, this movie version has not been done since 1968. That being a faithful telling of the story set in the proper period with the Old English set dressings and Shakespeare’s dialogue. Now, Italian Director Carlo Carlei’ (“Il generale Della Rovere”) shines his light from yonder movie projector to give us his lavish spectacle of this tender young love story. 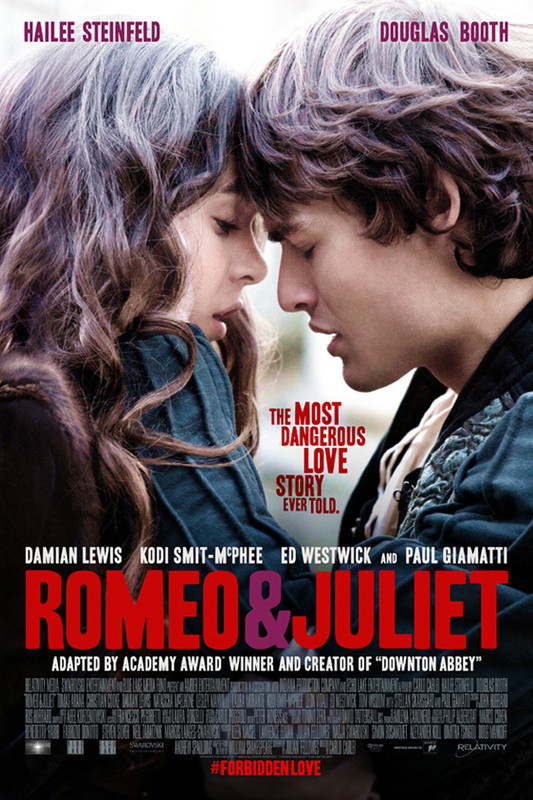 The movie was pretty, as was young Juliet (Hailee Steinfeld from “True Grit”) in capturing the attention of Romeo (Douglas Booth from “LOL”). The performance of the leads was passable. They delivered the lines but not the full emotional impact you want from these characters. To make up for this, the filmmaker has added a pounding score to pull at your heartstrings. Even in the balcony scene, the music was so loud I could hardly hear the actors. Just because it’s a great story does not mean I can’t attack the plot, or at least its presentation in this film. The two schemes Romeo and Juliet hatch with Friar Laurence (Paul Giamatti from “Rock of Ages”) come off like a bad “Three’s Company” episode. I am not sure if some of the blame belongs to screenwriter Julian Fellowes (“Gosford Park”), but I am not going to blame the other writer. I admit that I don’t know the real Shakespeare work, and I prefer the modern homogenized versions of the story. I dug the Baz Luhrmann version (Romeo + Juliet – 1996), which had one foot in the 16th century. Going in, I wondered why anyone would make this movie, and who would want to see it. Coming out I understand why they tried, and I wish they had succeeded, because now I want to see this masterpiece in all its period glory. While the sets were beautiful, they are just backdrops. The words of Shakespeare are merely spoken. But the power of the story cannot be achieved with cheesy music and “Reservoir Dogs” style slow motion. There was more good than bad in the movie, but I have to grade on the Shakespeare curve. When you set out to tell the greatest story ever, you better get it right. I can only give them 2 stars out of 5, and I am certain this film will soon fade from yonder flat screen windows. 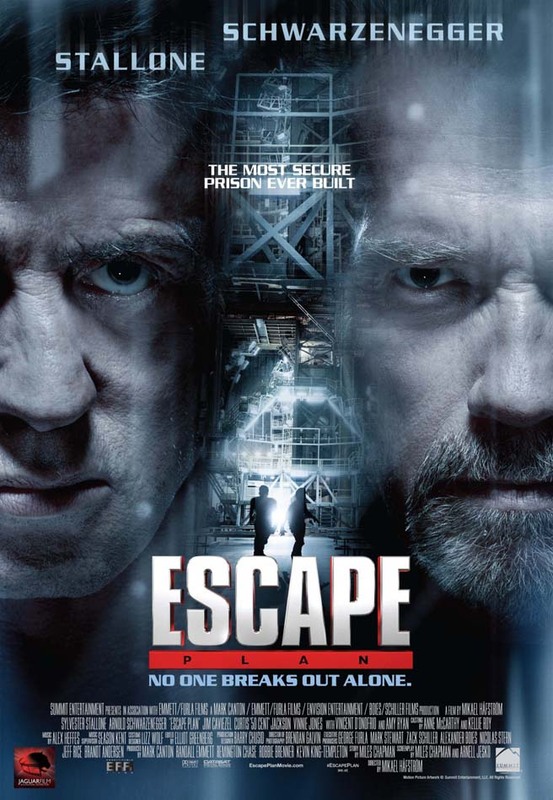 “Escape Plan” sounded good for today, because that’s what movies are all about – an escape from our mundane lives. Breslin (Sylvester Stallone from The Expendables) is an expert at breaking out of prison. He’s so good, he gets seven figures each time he pulls a “Houdini” and exposes the security problems with the most secure federal prisons. He literally wrote the book on prisons and that works out great for him until he gets placed in one designed using his book. This prison is a private, CIA, “off the books” kind of place. Like Guantanamo without the health plan or an address you can find on Google Maps. This is where they send people they want to disappear for good. As you might guess, nobody knows it’s just a game this time, and Breslin is completely on his own. That is until he makes friends with Rottmayer (Arnold Schwarzenegger from The Last Stand.) I won’t tell you what Rottmayer has to do to win his trust, but I can tell you it’s hot. I kind of thought this movie was going to be like “Tango & Cash” which Stallone did over two decades ago, or a sequel like “Two Old Guys Make Cash.” At least neither one said, “I’m getting too old for this paycheck.” These fellas are in their late 60s, and they still got it, and there is enough story and plot here for a solid action movie. They throw in a mix of “Shawshank” and “Cool Hand Luke” moments along with enough originality to make it interesting. I like rooting for the prisoners and against Hobbes (Jim Caviezel from The Passion of the Christ), the sadistic warden. Even if there are some silly twists, I still got to see two icons of the action genre deliver one more right cross and heft a 50-caliber machine gun from the chopper and mow down the bad guys. Yeah, they make some of their signature moves, but not enough to have you rolling your eyes. “Escape Plan” was a nice surprise and a nice escape to the theater. I am giving this movie 3 ½ stars out of 5, and if you are like me and do not want to offend Brian De Palma (director of the original Carrie) by seeing the new “Carrie” out today, this is a great place to disappear for a while. 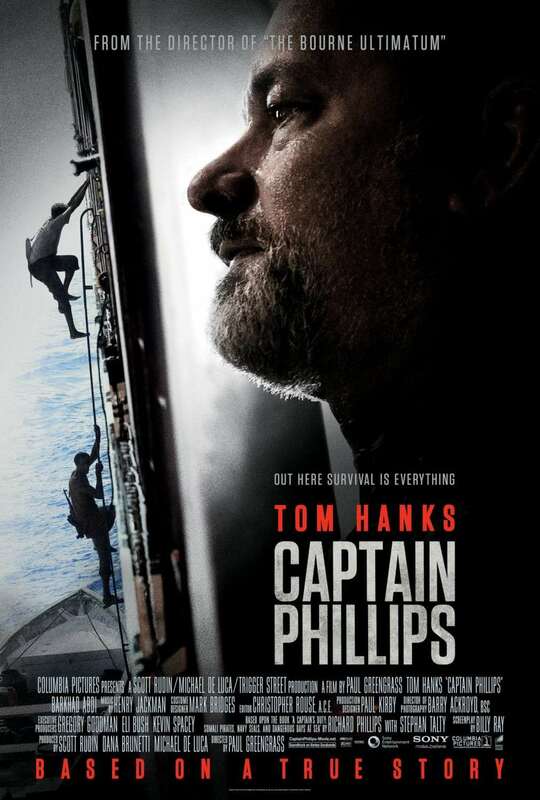 “Captain Phillips” opened today, and I don’t think I will ever set foot on a cargo ship in Somali waters again. The true story of Captain Phillips, played by real life movie star Tom Hanks (Larry Crowne), made the move from CNN to silver screen. When Captain Rich Phillips set out to cross the horn of Africa, the forecast was partly cloudy, 8-mph winds and a chance of piracy. These cargo guys know there is a risk, but they never think it will happen to them. It’s a good thing their company has a policy for such things, and the plan is “go dead in the water” just like a sitting duck. Plus, nobody will get hurt because they do not allow guns on board. When the pirates approach, the home office tells him to do his best Dustin Hoffman (Midnight Cowboy) – “I’m boating here – hey, I’m boating here.” Unfortunately the last Hoffman movie they saw was “The Graduate.” The pirates are led my Muse (Barkhad Abdi), who serves to put a face on the whole Somalia war lord business operation and the pirate pastime. We see what his home life is like and how he gets selected for this job much the same way we pick teams for volleyball. Director Paul Greengrass (The Bourne Ultimatum) does what he can to humanize the criminals and portray the whole exercise like the old SNL bit where muggers line up beside the ATM to politely rob people. This is just how it’s done in that part of the world. Until Captain Phillips and his able crew come along. Hanks is at his best at sea (Joe Versus the Volcano and Cast Away) and spends most of his time not trying to be a hero. His job is to protect the ship and crew and make it home to his family. The pirates’ job is to get millions of dollars for the Elders and sleep on dirt floors while their families starve to death. Paul Greengrass’ job is to make a drama on the water as gripping as last week’s drama in space (Gravity). Well, two out of three guys did their job. 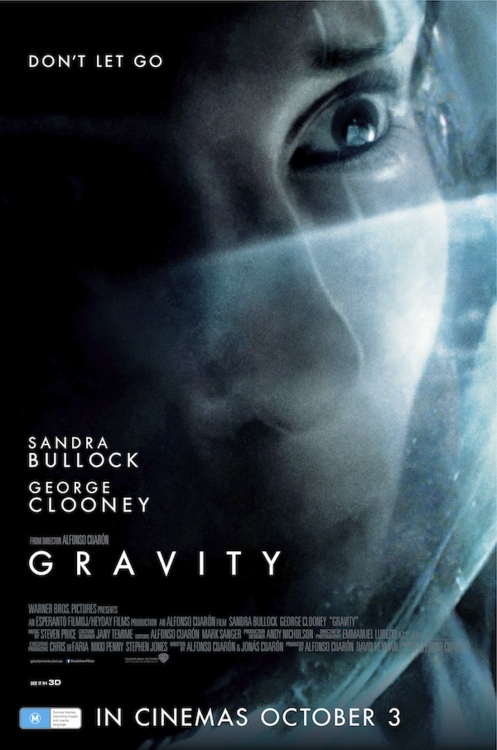 I am a big fan of “Gravity,” as I use it every day, but seldom do I see it presented so well in a feature film. I have to admit, this movie is out of this world. The Earth is ever-present in the background and serves to unify the characters, the story, and of all mankind. This global view comes from Writer/Director Alfonso Cuarón (Children of Men), his amazing Cinematographer Emmanuel Lubezki (Children of Men), and a couple of American movie stars from Virginia and Kentucky. There is a plot among the pretty pictures. Some critical maintenance is needed on the Hubble telescope, and Dr. Ryan Stone (Sandra Bullock from The Blind Side) makes the house call. Commander Matt Kowalski (George Clooney from The Descendants) pilots the shuttle with the calm confidence you want when you are 350 miles above the Earth. For you budding screenwriters, this is how you start a movie – in space inside a kaleidoscope of stars and satellites and character traits. The hack version of this movie would have put us through 30 minutes of backstory on the ground and a dozen setups you know will be paid off in the third act. Cuarón takes us right to where the action is and just a few minutes before they run into trouble. From there on, our characters are on their own, and a long way from home and not tethered to any typical story format. I am not sure what the theme of the movie was meant to be, but for me it was “keep going.” The IMAX screen kept moving, rolling and reeling through Space, as a way of saying life will keep going. Even if you stand still and do nothing, the world and everything else is going to keep going. You can tap out if you like, take the easy way, or decide you have something to live for. Bullock’s performance carries the story amidst the most real Space imagery I have ever seen. I am not talking about science fiction – I am talking about science fact. Everything looked, felt and seemed real, and it kept me at the edge of my seat. The only way I can describe how intense the movie was is to tell you I did not get up to pee in the middle… and I always pee in the middle. I never felt stable or comfortable during the entire movie. I lost sight of the horizon and could not get my bearings or figure out what was going to happen next. I know, “in Space no one can hear you scream” (Alien – 1979), but from this movie I learned if you cry, the tears will float on in space forever. This is a movie to see on the big screen – a screen so big that it makes the Earth look small, and all the problems on the Earth become small when compared to “Gravity.” I am giving this movie 4 ½ stars out of 5 and a warning to pee before the movie starts.